from 3 pcs. 6,71 EUR ea. Luck is radiating in all colours of the rainbow here. 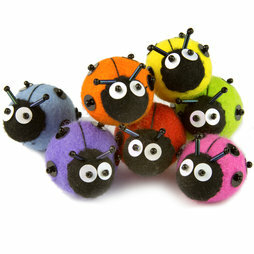 The cute-looking bugs are handmade in Switzerland and of high-quality wool felt and sequined. Every lucky one of them is unique! A strong neodymium magnets in the belly of the bug holds your notes, postcards and shopping lists.